Note: Starting 2012, I’ve deactivated my FB account for the first few months; hence, the post topic. So with the New Year here and that emotion washed away, I grew up a bit. I deactivated my Facebook account, brought a magazine, “The Artist’s Guide to Illustration” from Barnes and Noble and started designing whatever I wanted to do. I am giving myself a new project each week. It doesn’t matter what it is—as long as I’m doing something new and out of my designing skill set. Why I did what I did: Deactivating my FB account brought back my attention to designing and I did not have to worry about a social life that I only read on FB. The magazine I chose is to help me build my Adobe Illustrator skills. My drawing skills and the pen tool does not come easily to me. So, first off---to Master Illustrator. I find it hard to navigate in Illustrator and usually avoid using it. My goal is to get use to all the tools but I’m still all for Photoshop! If I wanted to gain something, I had to lose something. I gave up Facebook to gain more education in my designing skills. Be consistent and you’ll be the last one standing. I can only reach my goal if I practice and build myself each week. I didn’t come to Los Angeles for nothing. Don’t wait for anything or anyone. Last year, I did a lot of waiting and observing. It found that a waste of time. This year, it’s all action and being smart about my choices. If it will help me and it’s positive---I’ll take it. 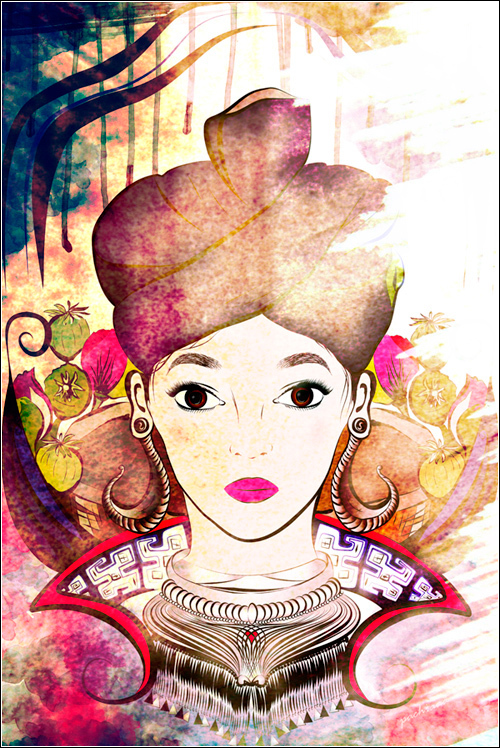 I’ve always wanted to do a Hmong related design so the first week was dedicated to my culture, Hmong. I gathered all my resources of pictures and started drawing and erasing the first day to create something bold, light and refreshing. This piece reflects a lot of my inner thoughts on what Hmong means to me and what matters to me in my culture. The girl represents beauty, of course but she also represents innocence. She’s innocent to her own mind and what capabilities she may have. Her jewels add to her beauty. Someone told me, the more jewels you have, the richer you are. 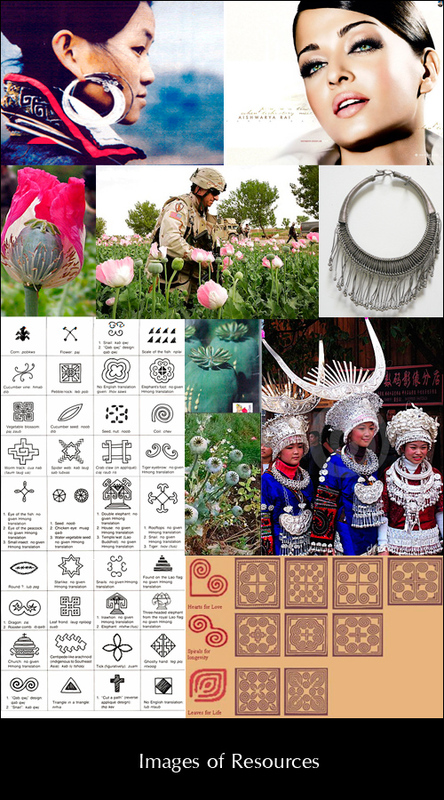 The jewels simply represent the Hmong culture to me. The Hmong textile collar embraces that Hmong neck piece even more and your attention to linger in the culture. Because I don’t like wearing Hmong hats, I left her hat that deep black purple with no Black and White stripe. I made her earrings huge because I recalled my mother’s mother’s real aged silver earrings. I was told they were larger than today’s modern Hmong earrings and weigh a lot. And I made her eyes big to make sure you look at her face ---as perfect as it seems, her mind is not. I purposely set her in a opium field because over the Holiday, I watched a Hmong film someone had captured last year during the Hmong New Year in Laos (?) and it was simply a video camera guy, going from girl to girl, aiming from head to toe and asking their name, location, age and telephone numbers so old guys in America can call them. I was disgusted. The more I watched, the more I got upset. What killed me was when the camera guy asked what they level of education they were in. The young girls of ages 16 to 22(oldest) said level 6? I believe that’s not very far…unless I’m wrong. Somehow it hit me that the girls don’t go over the age of 23 without getting married and trapped into harvesting farms for the rest of their lives. I almost think they don’t see themselves bigger than what they can do and become. The world is so big, yet they are stuck there. I’m rather saddened by that idea. Lastly, I added the opium flowers because when I first moved to Los Angeles and roomed with new roommates--they didn’t know what Hmong was. I explained and one guy mentioned something about using opium drugs and such. I was shocked because that information was not even in my mindset. I laugh and said yes, I guess Hmong people smoke opium. It felt weird to admit even that was part of the Hmong culture. I believe I’m jumping all over the place but everything created this image without me realizing it. The following is my progress of developing the whole artwork. I drew, inked, scanned, photoshopped, traced, repainted, redrew, colored and then photoshopped effects in. 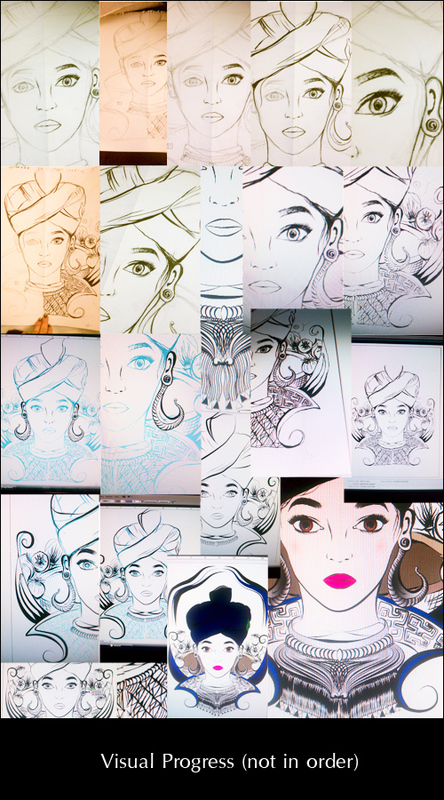 The following are my progress of developing the whole artwork. I drew, inked, scanned, photoshopped, traced, repainted, redrew, colored and then photoshopped effects in. Each day of the week, I had a stopping point I felt I had to reach. I was very determined.